The 440th was activated on 1 July 1943. The 440th trained for the allied invasion in France with formation flying, re-supply drops and glider towing. The 440th like all the other Troop Carrier groups flew in the twin-engine Douglas C47 Skytrain. The aircraft was slower than the bombers and the fighters and was restricted in the altitude on which it flew. This meant that it was vulnerable to anti aircraft fire but also that it had to fly through bad weather while the bombers could fly above it. The aircrafts executed their attack at 700 feet at night and 500 feet by day, at speeds between 100 and 125 miles per hour. Col. Frank X. Krebs commanded the 440th. Krebs, he was a very experienced pilot when he arrived at the 440th. The 440th arrived in England early in 1944 where in continued it's exercises for the invasion in combination with the other Troop Carrier groups and the 82nd and 101st airborne divisions. Right before the invasion the 3rd Bn of the 506th PIR and elements of the 326th GIR from the 101st Airborne division where quartered in closely guarded quarters on the airbase Exeter. On 5 June the group received word that the invasion was on. 45 aircrafts had to bring the men of the 101st to drop zone D southwest of St. Marie du Mont. A large cloud of fog scattered the formation over the peninsula. The 440th lost three aircrafts in it's run to the dropzone where anti aircraft fire was intense. One aircraft went down with all the paratroopers and crew on board. Many paratroopers of the 3rd battalion of the 506th where killed right after landing, including their commander lt. Wolverton. For their actions 440th Troop Carrier Group earned the Distinguished (Presidential) Unit Citation for the Normandy missions. After D-day the 440th flew supply missions and evacuated the wounded from France. In July a detachment of the group was send to Italy. It took part in the invasion of Southern France. On 15 August 1944 it dropped paratroopers from the 517th Parachute Infantry Regiment. On the days after the invasion it towed gliders into the area and dropped supplies. The detachment rejoined the 440th ten days later and the group as a whole moved to France on 11 September 1944. The group took part in operation Market Garden. 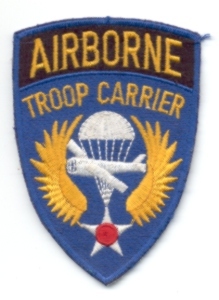 It dropped troops from the 82nd Airborne division near Groesbeek on 17 September. A day later it towed gliders to the same landing area at Klein Amerika. The second glider lift was scheduled for the 19th but due to bad weather it wasn't until the 23rd that it could take place. The 440th again flew troops to the Nijmegen area. The story above is a small summary quathered from various sources on the internet but most importantly with information from the 440th TCG Association website. No pictures of the 440th Group are available yet.